To me, because this is the second issue of the Reglar Wiglar to be published in ten years! To you, because you are reading this. These are impressive feats. We are both definitely on a roll. Bonus points if you read the previous issue, which was the first installment of my three-part (but possibly neverending) series concerning all the jobs I’ve had in my life so far. It’s a good place to start, but if you didn’t start there, but are starting here instead, don’t let that prevent you from moving forward or going back. This issue picks up in 1988 and details my slide into the restaurant industry, and all the pleasure and pain found therein, but mostly pain. In just a few short years my career propelled me from simple dishwasherdom to the rock star life of a line cook. There were a few brief forays into telemarketing as well. Apparently, when I was younger, I could swing through big life changes like an apeman on a vine. Changing schools, jobs, apartments—all within months of each other—that was just how I rolled. Most of this issue was put together in Madison, Wisconsin, where I lived for three years and three months for some reason. I only had three jobs during my time there, but those recollections are for a future issue. Also ahead, my further hash-slinging adventures in more bars and bistros, plus a long stint in the newspaper classified ad business, a very short journey through ad agency hell, unemployment, an untriumphant return to food service, even more food service and a job doing art installation that nobody could have predicted. What will be the exciting conclusion to all this? Will it be over? Will I finally hang up my apron and become self-employed? Inquiring minds want to know. I want to know. Until then. For now. 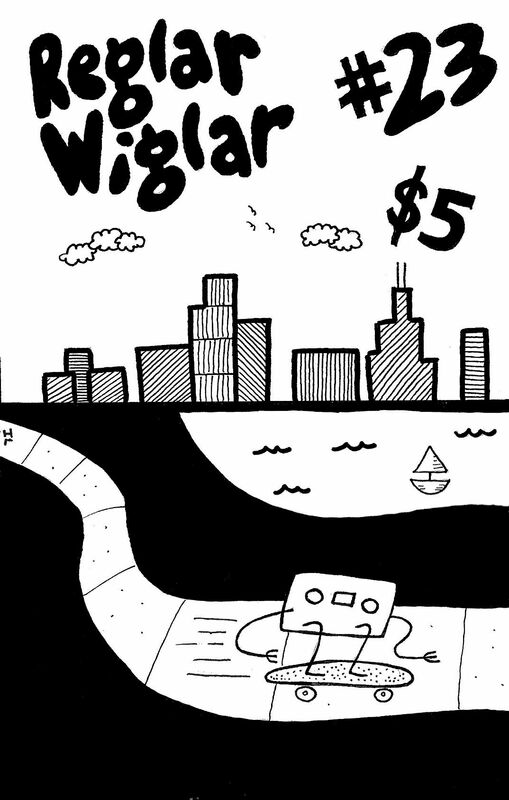 Here is Reglar Wiglar #23 for your reading enjoyment. Once again, I hope you get a good swift kick out it.